Walk into any branch of WH Smith and the shelves of the Geek Media section are overstocked with copies of the current DOCTOR WHO MAGAZINE and about half a dozen bookazine spin-offs. The latest, the Yearbook, is out today. Plus, most branches are still carrying one or two copies of the hardback Making Of part work, derived from the Panini/ Marvel back catalogue. Add Panini's own DOCTOR WHO ADVENTURES, Titan's DOCTOR WHO COMIC and their new Collectors Edition format TALES FROM THE TARDIS series (I picked up the launch issue yesterday) and that's a lot of Who. So I thought was would go back to where it all began (although DW strips date back to TV COMIC in the Sixties) with the first issue of Dez Skinn's Marvel UK launch: DOCTOR WHO WEEKLY. My copy has long since parted company with the cover-mounted transfers but its still an iconic cover. 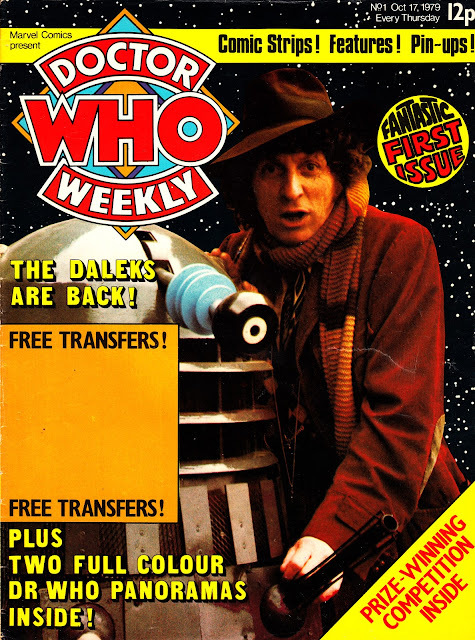 Tom Baker even went as far as going on a mini-tour, in costume, to promote the launch.